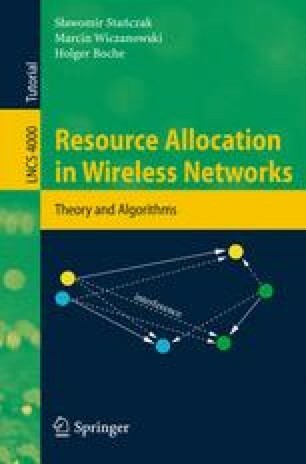 This chapter formulates the resource allocation problem for wireless networks. Before that, however, we briefly discuss the fundamental trade off between efficiency and fairness in wired networks. This trade off eventually led researchers to consider the problem of maximizing the sum of increasing and strictly concave utility functions of source rates. We review some existing solutions to this problem and explain the insufficiency of these solutions in case of wireless networks. Section 5.2 reformulates the problem to better capture the situation encountered in wireless networks. We will argue in favor of MAC-layer fair policies that have already been used in wired networks as a basis to achieve end-to-end fairness. We precisely define the concept of joint power control and link scheduling as well as introduce the notion of the feasible rate region. It is shown that this set is not convex in general, which makes the optimization of wireless networks a fairly tricky task. The utility-based power control problem is formulated in Sect. 5.2.4. In particular, we introduce a class of increasing and strictly concave utility functions of link rates for which the power control problem can be converted into a convex optimization problem. The reader will realize a strong connection to the results of the first part of the book because the inverse functions of the considered utility functions are log-convex functions. Finally, we will utilize some results of Chapt. 2 to obtain valuable insights into the problem of joint power control and link scheduling.